On the visit of my Canadian friend Romeo to Ilocos Norte, I took him to Paoay town and we took snacks at Herencia Café where he tried the pinakbet pizza and he liked it. We met Peachy here, a traveler who went with us visit the Paoay Church. This church is a UNESCO World Heritage Site with a baroque architecture. It endured so many earthquakes. Its sturdiness is attributed to the materials used in this structure such as the coral stones, bricks, lime, sand and even egg white as binder so they say. It has beautiful buttresses that also helped toned down the impact of temblors. Its bell tower stands a few meters away. Belfry is a tower which contains a number of bells. The bell is usually rung to signify time or activities or events in the church such as mass, weddings and funerals. The bell is rung more times for the weddings of prominent clan than it would for the poor so it became a status symbol. Bell towers nowadays are kept for their iconic value. The word belfry comes from an Old French term berfrei derived from Germanic bergan, to protect and frithuz meaning peace. It was originally used as a watch tower providing protection against hostile incursions. 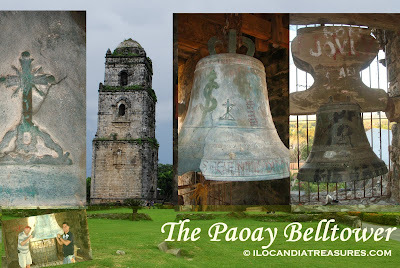 The Paoay bell tower is a three-storey coral stone bell tower built a few meters from the church. This served as an observation post for the Katipuneros in 1896 during the revolution against Spaniards and for the guerillas during the Japanese occupation in World War II. We were lucky to get into the top of this belfry where we requested the custodian to open it for us. It has long winding stair which some of the steps were shaky or shabby. One would be taking steps cautiously to get up. It houses some of the bats that stink the place. On top, one can view almost the entirety of the town proper and it’s a beautiful sight.